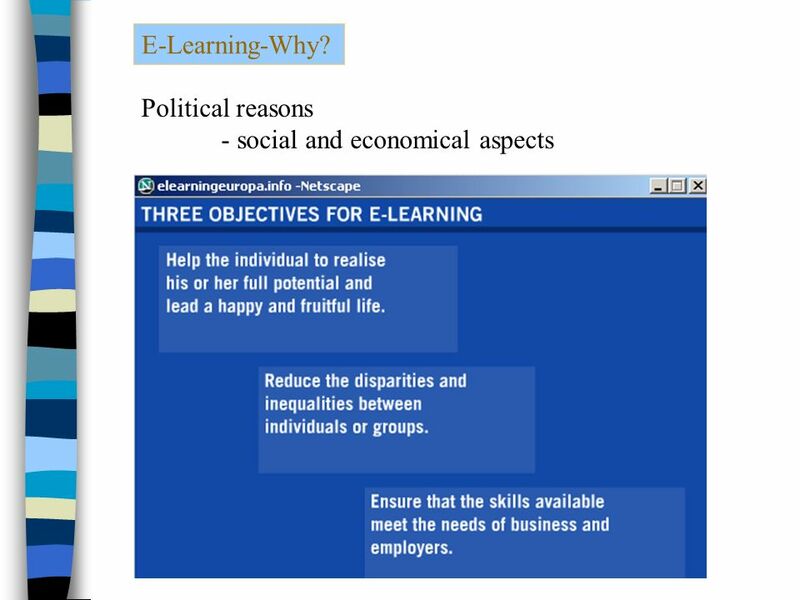 7 E-Learning-Why? 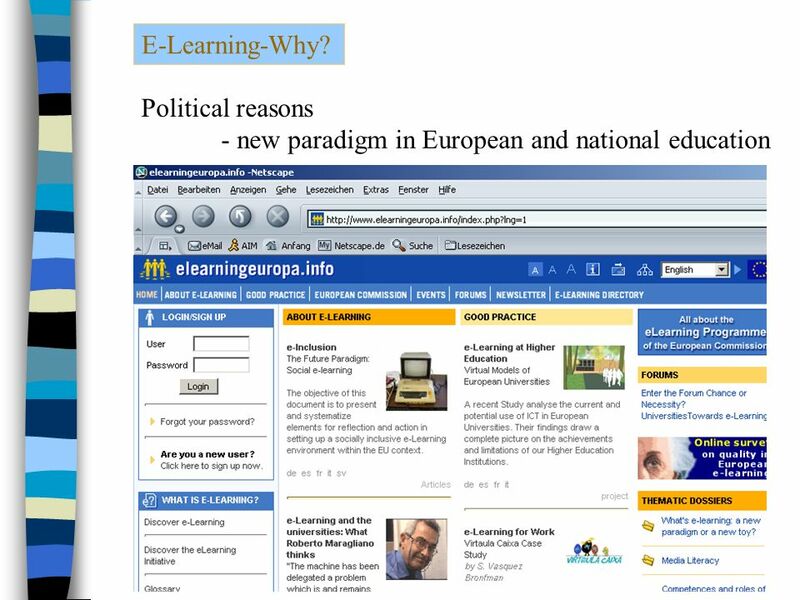 Political reasons - new paradigm in European and national education Paedagogical/didactical reasons - integration of media, modular - individual learning/ group learning - interactivity ? 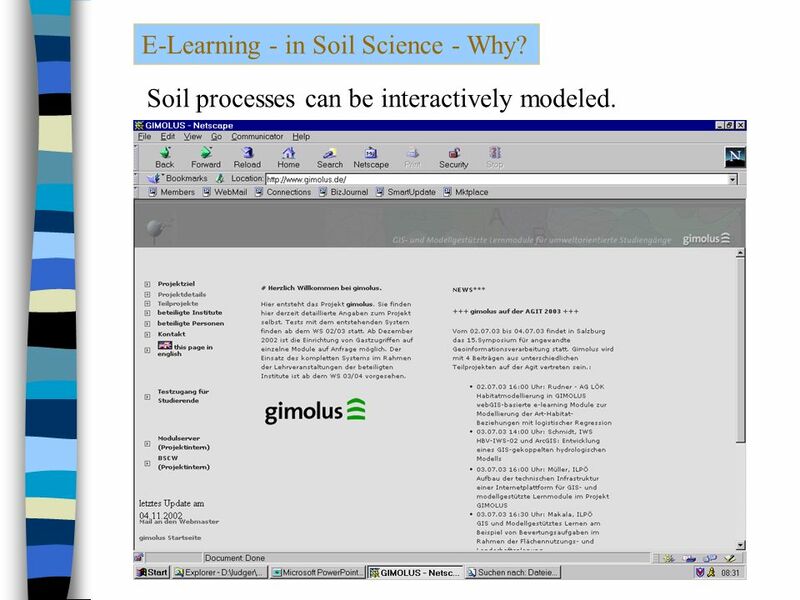 9 E-Learning - in Soil Science - Why? 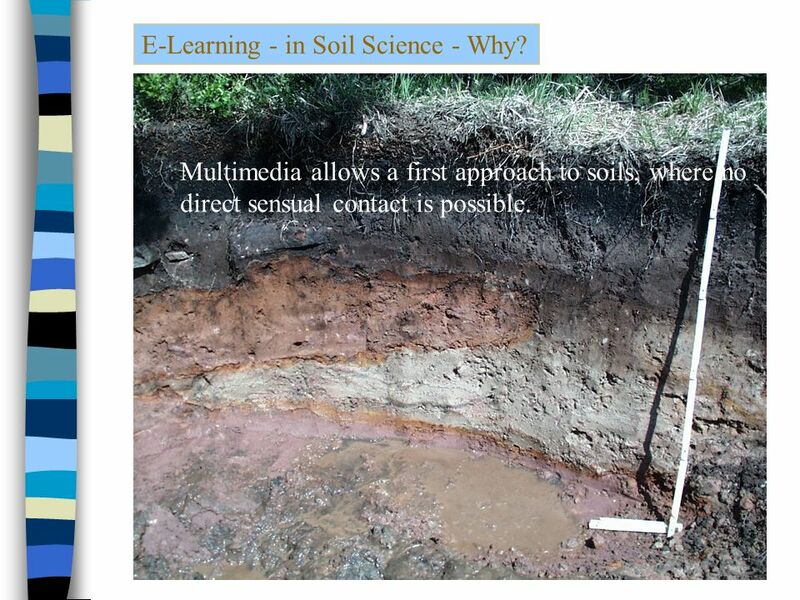 Multimedia allows a first approach to soils, where no direct sensual contact is possible. 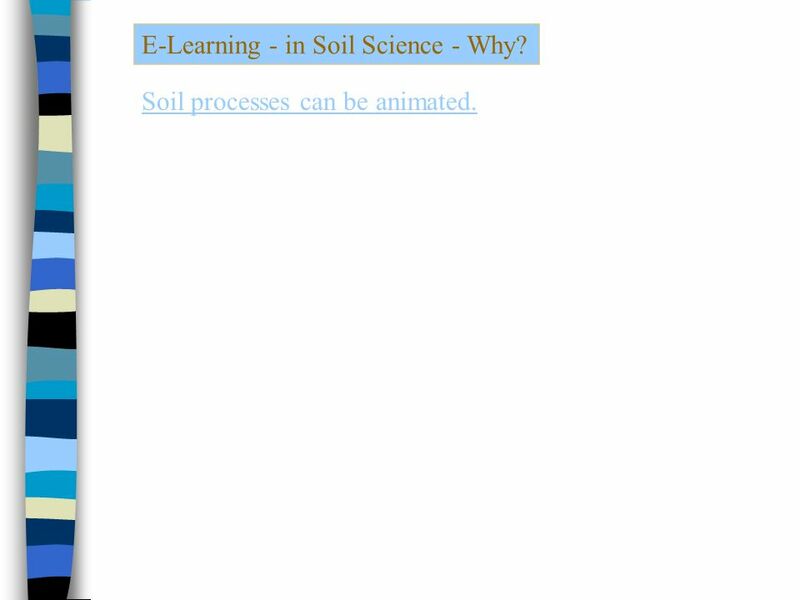 10 E-Learning - in Soil Science - Why? 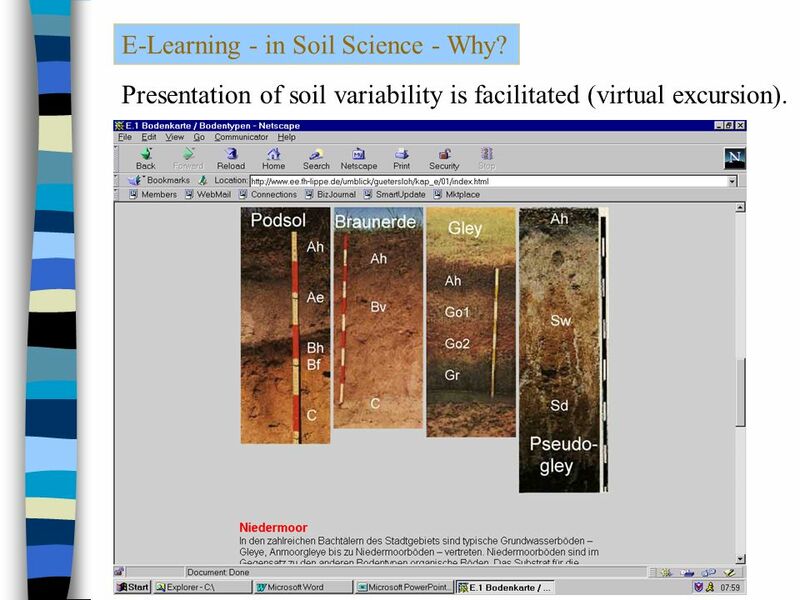 Presentation of soil variability is facilitated (virtual excursion). 11 E-Learning - in Soil Science - Why? Soil processes can be animated. 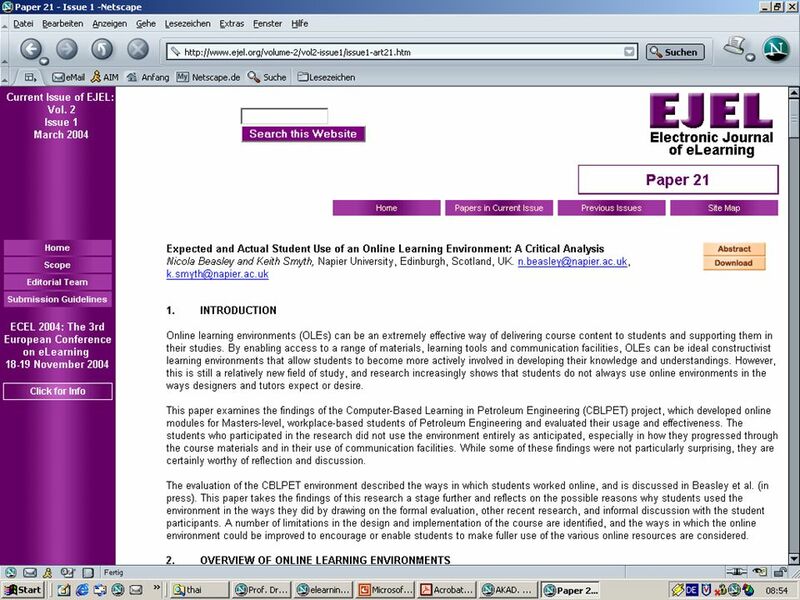 12 E-Learning - in Soil Science - Why? Soil processes can be interactively modeled. 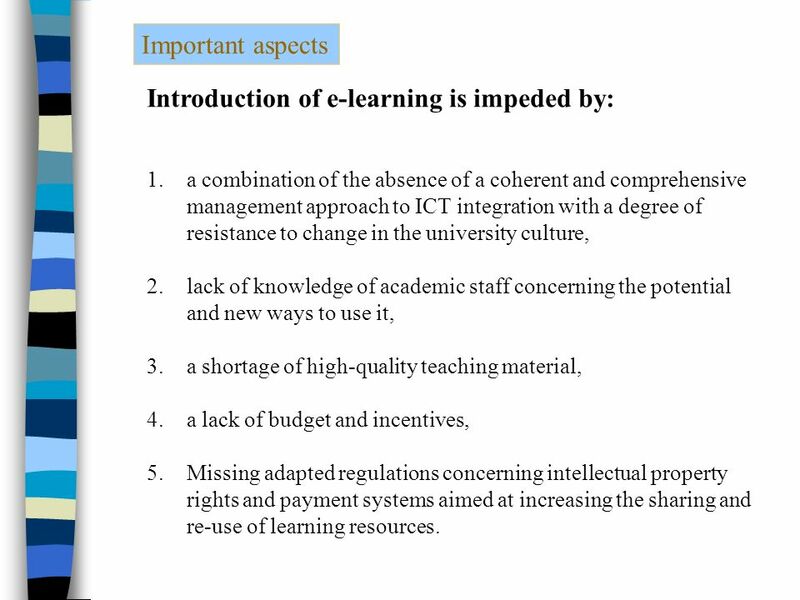 16 Important aspects Introduction of e-learning is impeded by: 1.a combination of the absence of a coherent and comprehensive management approach to ICT integration with a degree of resistance to change in the university culture, 2.lack of knowledge of academic staff concerning the potential and new ways to use it, 3.a shortage of high-quality teaching material, 4.a lack of budget and incentives, 5.Missing adapted regulations concerning intellectual property rights and payment systems aimed at increasing the sharing and re-use of learning resources. 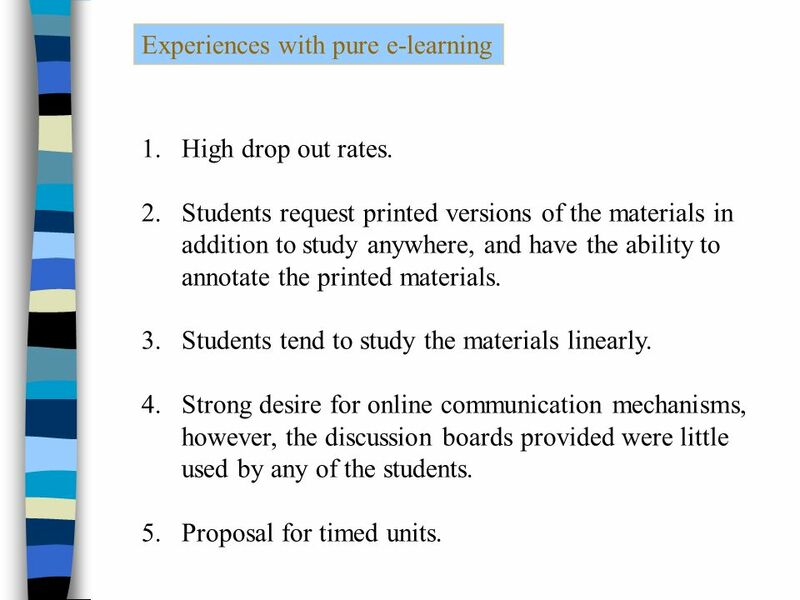 20 Experiences with pure e-learning 1.High drop out rates. 2.Students request printed versions of the materials in addition to study anywhere, and have the ability to annotate the printed materials. 3.Students tend to study the materials linearly. 4.Strong desire for online communication mechanisms, however, the discussion boards provided were little used by any of the students. 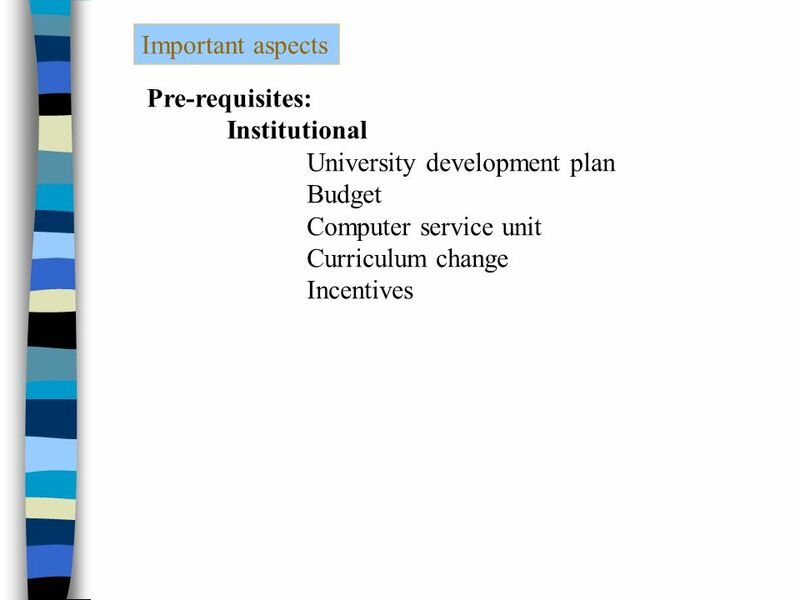 5.Proposal for timed units. 21 Questions to be asked before starting e-learning units What are the needs, requirements, and preferences of learners? Can we be sure that the technological infrastructure is reliable and adequate?... that the pedagogical and graphic design of the content is of high quality?... that the level of interactivity is appropriate?... that students can reliably access the relevant portal on a regular, reliable and convenient basis? 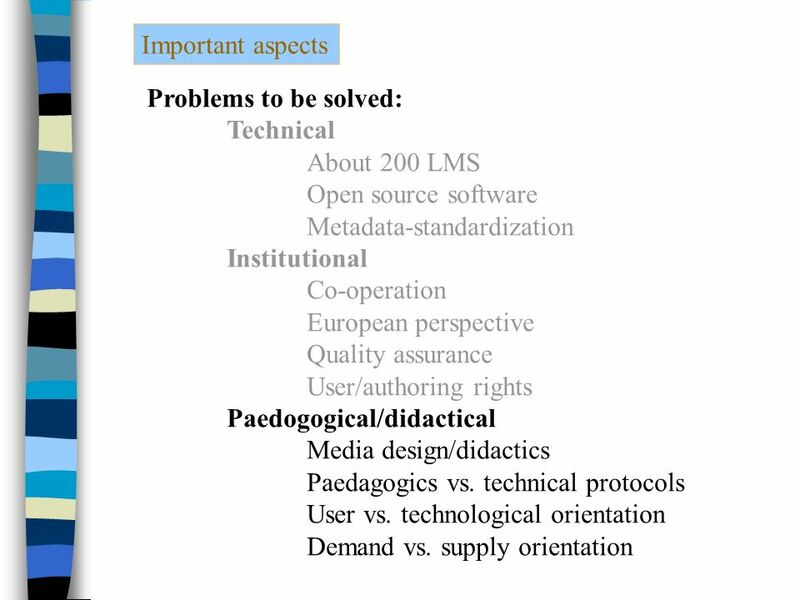 23 Open source software Intelligent tutorial systems Metadata standards Inter-operability European perspective Blended learning M(obile) - Learning New/permanent financial sources? Management skills (e-learning projects) Commercial application Property rights Sustainability? 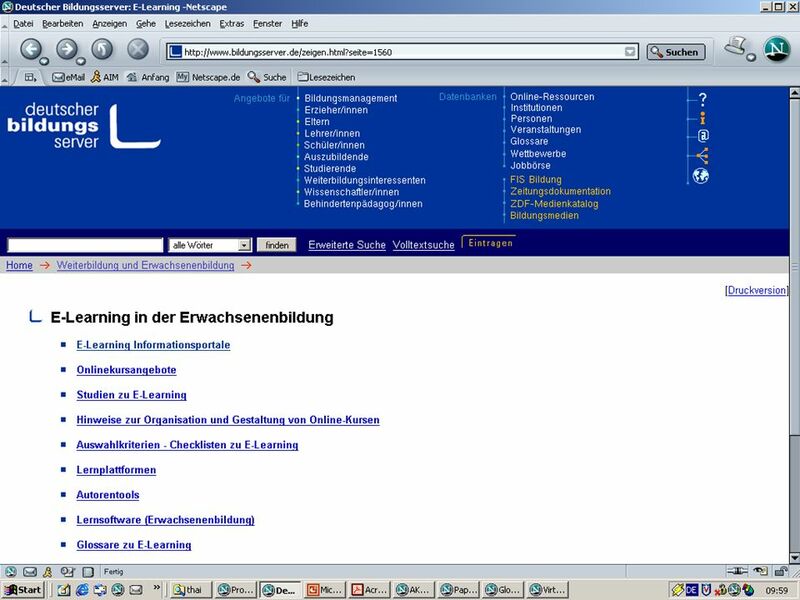 E-learning....and the future? 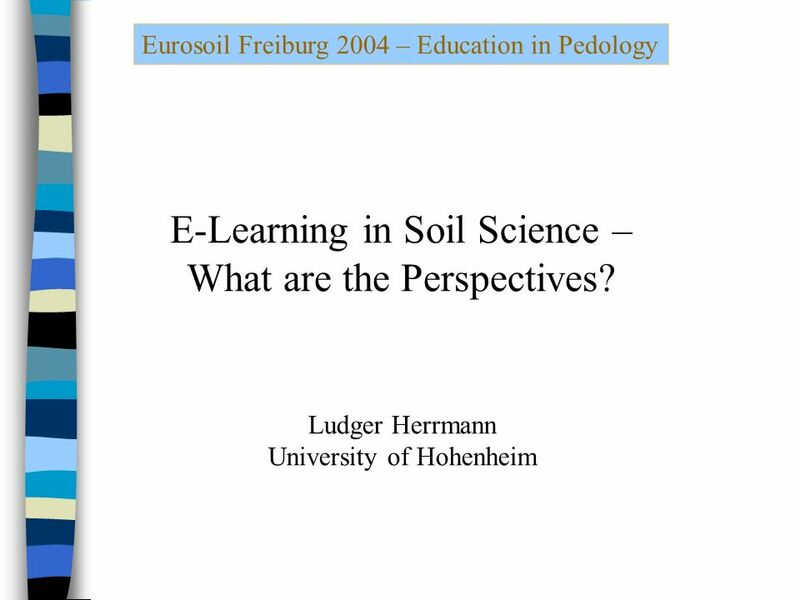 Download ppt "Eurosoil Freiburg 2004 – Education in Pedology E-Learning in Soil Science – What are the Perspectives? Ludger Herrmann University of Hohenheim." 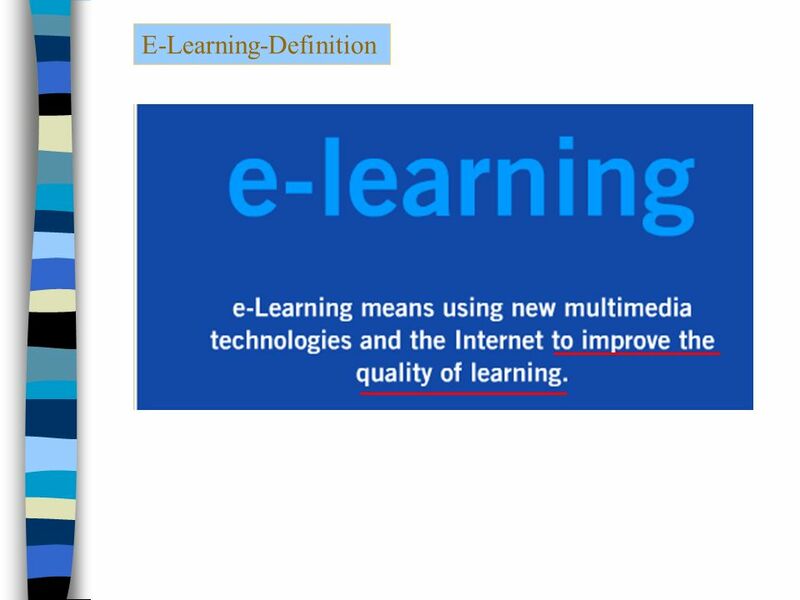 E-Learning E-learning means all teaching and learning forms supported by modern ICT. The e-content can be organized interactively and in a multimedia. Technische Fachhochschule Berlin University of Applied Sciences © 2004 TFH Berlin | Labor Online-Learning From Project to Sustainability: The implementation. A Very Big Adventure Using the internet to enable multi- institutional collaboration in teaching computer ethics Joe Griffin, Dept of CSIS. Management for sustainable education Don Passey, Senior Research Fellow, Co-Director, Centre for Technology Enhanced Learning, Department of Educational. D2.1. PEDAGOGICAL FRAMEWORK Matjaž Debevc UM FERI. Towards Adaptive Web-Based Learning Systems Katerina Georgouli, MSc, PhD Associate Professor T.E.I. of Athens Dept. of Informatics Tempus. Creating Collaborative Models of Course Development and Delivery Inma Álvarez Open Meeting on Less Widely Taught Languages University of London, 15 th. 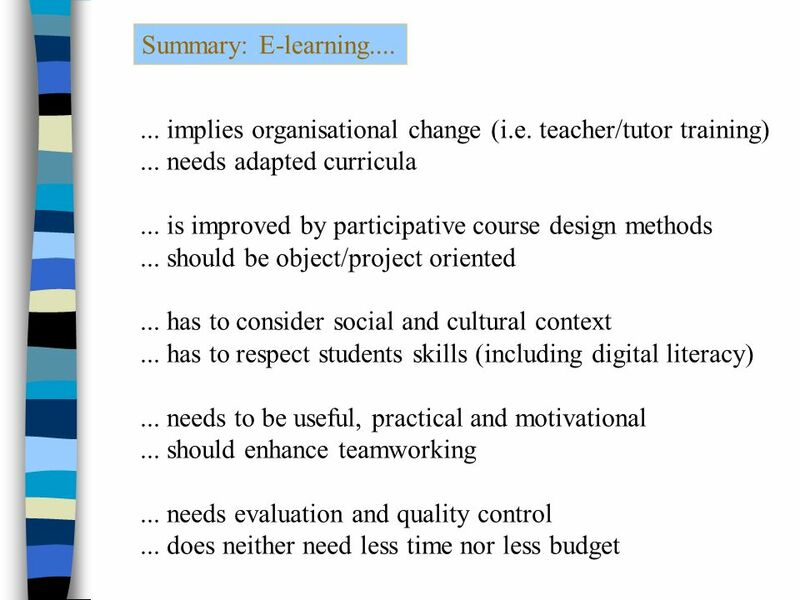 Checklists Stakeholders Methods Pedagogy Learning styles Writing styles Style and language Content Intercultural aspects Multimedia Questionnaires Examples. University Strategies towards the Integration of ICT in the Teaching/Learning Practice Joe Cullen, Tavistock Institute Mario Barajas, University of Barcelona. Workshop IVETTE Teaching/Learning Policy recommendation University of Barcelona Division V- Science Education November, 2000. Contextual framework for research. Purpose of contextual framework To provide a shared language to underpin the PHEA E-learning proposals, initiatives.